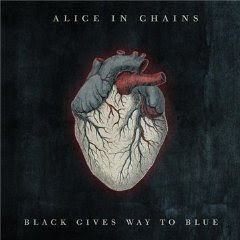 Hall of the Mountain King: Review: Alice in Chains, "Black Gives Way to Blue"
Review: Alice in Chains, "Black Gives Way to Blue"
I'll be honest off the top in this review. I didn't want to like an Alice in Chains record without late vocalist Layne Staley. Staley is, perhaps, one of the most underrated singers to come out of his era. While Nirvana frontman Kurt Cobain is celebrated by the press and fans of Seattle's grunge sound of the early 1990s, Staley seemed to fade slowly away, his death in 2002 barely a footnote in comparison. Yet, you'd be hard-pressed to listen to just about anything on rock radio these days without hearing the influence of Staley's wounded moan. His was a distinctive and powerful voice, perfect for the music of the band which could go from an acoustic whisper to a heavy metal roar in an instant. In the eyes of fans, a replacement singer is sure to be a hard sell. So, it comes as a bit of a surprise to me that "Black Gives Way to Blue" has spent the last week in my CD player without a break, and I'm enjoying it more with each listen. Just so things are straight, no, this record is not as good as Alice in Chains' 1990 debut "Facelift" or its landmark 1992 album "Dirt." It's not even as good as the self-titled 1995 record made as Staley was spiraling down into the drug-induced depression that eventually led to his death. But it's a far better album than I expected and certainly a worthy addition to the catalog. New singer William DuVall does his best, often sounding eerily like the original, though his voice lacks much of the darkness and intensity of Staley's wails. Guitarist Jerry Cantrell also takes on a heavy share of the vocal duties, as he always has, to help create those classic Alice in Chains harmonies. Musically, the record is as solid as fans would expect, and quite melancholy as many of the songs revolve around Staley's life. "Black Gives Way to Blue" starts a bit slowly with "All Secrets Known," which seems to be an attempt to prove early on that this record will still sound like Alice in Chains. Unfortunately, the song is a bit boring, constantly building to a peak that it never reaches. Second track, the single "Check My Brain," is the closest the record gets to an upbeat song, and it sounds a bit too much like it was written with radio in mind. Things begin to pick up with third number, "Last of My Kind." It opens with a dark verse that puts me in mind of some of the tunes toward the end of "Facelift," then explodes with a big, driving hard rock chorus that's probably one of the least Alice in Chains-sounding pieces on the record, but also one of the most memorable moments. They follow up with the acoustic number "Your Decision" that would not have been at all out of place on the band's incredible 1994 EP "Jar of Flies." It's territory they'll explore successfully again later in the record with "When the Sun Rose Again." The vibe gets heavy again with the droning opening riffs of "A Looking In View," an epic, cascading wall of sound with the trademark warbling harmonies from the band's early work and also some nice vocal moments for DuVall scattered throughout. Then we get the melancholy, haunting harmonies of "Acid Bubble," interrupted a couple of times with a heavier, rawer guitar riff that jars the listener, but in a good way. "Lesson Learned" offers up a nice heavy groove with a memorable melody that strikes a good balance between the gloomier material and mainstream rock. The end of "Black Gives Way to Blue" offers up another mixed bag. "Take Her Out" opens with an interesting, exotic-sounding guitar lick, but doesn't elevate itself to the level of the really good songs here. "Private Hell" features some of the best harmonies on the record, but just seems to be missing something. The album-closing title track is the one that most directly addresses the loss of Staley, and it also pulls out some big-time firepower with piano work from Elton John. By its very nature, the song has to be very morose, and it is. I'm really undecided about the tune. I like it, but it's a big downer to end a very good record on. Alice in Chains has served up a bit of a curve ball for me. Having heard DuVall's voice with his previous band Comes with the Fall (of which I'm not a fan), I didn't think he was at all the right person for the job. And I'll admit, my feelings are mixed in praising this record. Even in its strongest moments -- and there are many -- I have to wonder how much better "Black Gives Way to Blue" might have been were we able to hear it with the original lineup. Regrettably, that's not possible, and it's not really fair to this lineup. So, yes, DuVall succeeds and "Black Gives Way to Blue" is a very good record, possibly even a top 10 choice for the year. But fans with strong ties to the original lineup should also expect a twinge of regret and sadness to come along with the enjoyment of the album. Perhaps that's as it was intended and as it should be. Get "Black Gives Way to Blue."